Andy has designed extensively for CIT showcases and year-end productions. He co-founded and co-facilitates the Production and Design Mentorship program and regularly engages CIT students and grads to work with him on professional productions. Storyweaving with Muriel Miguel. The following shows and sets are literally created by the 2nd and 3rd year students on-site. The stage must be designed for maximum flexibility with minimum rehearsal, also lightweight for a one-day install. This is why they are often in classical proscenium formation with several wings for entrances and exits. They are constructed using stretched fabric, coroplast, plastic and salvaged materials. 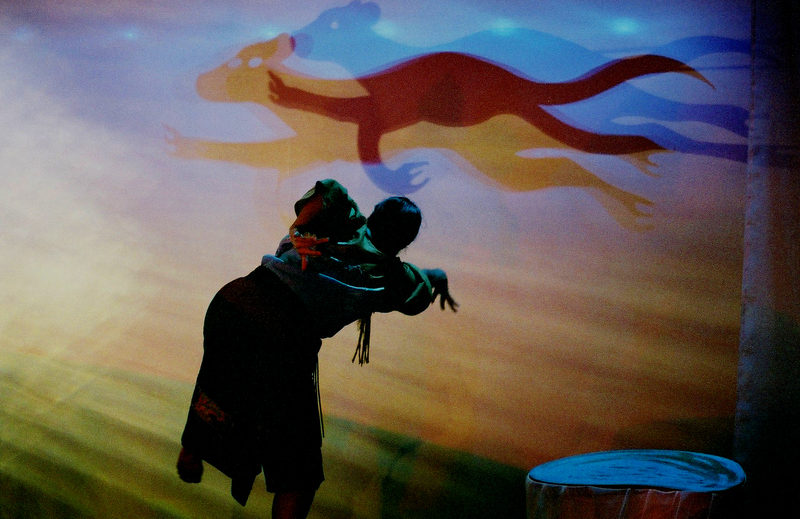 Lighting and projection are often employed to great effect and students shadow this proces as well, taking turns programming and operating the performances.